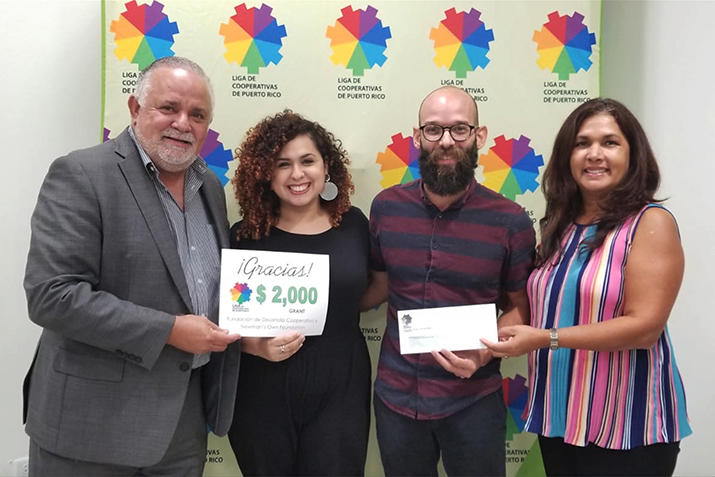 Recipients of La Liga de Cooperativas in Puerto Rico accept a donation from money raised by an organization of food co-ops and partners in the natural and organic products industry. Why would a bunch of grocery stores in the U.S. mainland raise money to help rebuild a fish market, a funeral parlor or a recreation center in Puerto Rico? Because we have cooperative ownership in common, and as community-owned businesses, co‑ops stick together. In fact, it’s one of our international cooperative principles. In a showing of solidarity, National Co+op Grocers (NCG), our organization of 146 food co‑ops across the United States raised $150,000 for the Cooperative Development Foundation (CDF) to support the rebuilding of cooperatives in Puerto Rico destroyed by Hurricane Maria in 2017. We raised this money during our annual grocery and wellness conference organized by NCG. Donations were solicited from companies in the natural and organic products industry whose items we sell, and NCG offered a 100% match for all donations. Hurricane Maria, which hit Puerto Rico in September of 2017, was the worst tropical storm on record in the island’s history, in many areas the destruction was total. CDF, which is working with local cooperative organization, La Liga de Cooperativas de Puerto Rico, is distributing the money in grants averaging $2,000-5,000 each to many of the more than 200 cooperatives on the island. The cooperative economy thrives in Puerto Rico, where people have formed co-ops for almost anything you can imagine. There are credit unions and housing cooperatives, which are common all over the world, but people have also leveraged the model to form cooperatively owned funeral homes, medical equipment suppliers, fish and seafood markets, ecological conservation centers, campgrounds, cafeterias, the list goes on. Working together to meet shared needs is a common sense approach when resources, financial or otherwise, are scarce. Co-ops empower communities to develop sustainably, making people less dependent on outside investors and employers for their basic needs and livelihoods. Co-ops in Puerto Rico that have received grants from CDF so far include La Lucia Community Fisherman’s Cooperative in Yabucoa, where they will be using funds to replace boats and fishing equipment lost in the storm and to rebuild their fish market, almost completely destroyed in 2017. A funeral services co-op in Cataño will use their grant to repair their roof and purchase a new generator to keep their chapel cool. In Loiza, a cooperative campground and recreational center maintains beaches, nature trails and camping facilities for the community to enjoy. They will be using money to replace their office’s sole computer and buy wood and materials to rebuild and outfit their rec center. It is inspiring to see what people can achieve when they work together to get things done. The success of the cooperative economy in Puerto Rico stands as an example of what is possible for communities all over the world. We are honored to be able to extend a hand, and our hearts, to our fellow cooperatives and citizens during this critical time of need. Want to help? You can make a donation to help rebuild cooperatives in Puerto Rico through their Disaster Recovery Fund.